Cam Cameron, in his second year as the Ravens’ offensive coordinator, made an immediate impact in 2008, building a creative offense that ranked fourth in the NFL in rushing (148.5 ypg), first in time of possession (33:10) and 11th in points per game (24.1 ppg). After one year as the Miami Dolphins’ head coach, Cameron brought his unique offensive mind to Baltimore. His successful stints with the NFL’s Chargers and Redskins and the NCAA’s Indiana Hoosiers and Michigan Wolverines have been celebrated. While in San Diego, Cam was instrumental in the development of Pro Bowlers QBs Drew Brees and Philip Rivers, RB LaDainian Tomlinson, and TE Antonio Gates. During Cam’s tenure (1984-93) as an assistant under Michigan’s legendary head coach Bo Schembechler, the Wolverines won six Big Ten titles and played in 10 bowl games. 2008: (with Baltimore) Was chosen by head coach John Harbaugh, who has known Cameron for more than 28 years, to lead Baltimore’s offense ... Cameron’s unit was a significant contributor to the team leading the NFL in time of possession (33:10 avg.) ... Helped guide rookie QB Joe Flacco to a highly-acclaimed first season ... Flacco won the Diet Pepsi (fan vote) Rookie of the Year award ... Ravens’ 18.1 average margin of victory ranked second in the NFL ... Ravens 24.1 points per game was second most in team history ... Created an inventive offense that included WRs throwing TD passes, QBs catching passes and NTs lining up on offense in goal-line situations ... Baltimore’s 20 rushing TDs set a single-season franchise record (18 in ’03), and the Ravens were the only NFL team to have a player with over 450 (Ray Rice), 650 (Willis McGahee) and 900 (Le’Ron McClain) rushing yards ... Baltimore finished with the fourth-overall rushing attack (148.5 ypg). 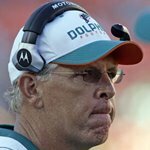 2007: (with Miami) Named head coach of the Miami Dolphins ... A 1-15 record was a harsh reality for Cam’s lone head-coaching season, whose only win (22-16 OT) came against the Baltimore Ravens on Dec. 16 ... Depleted by injuries, including QB Trent Green, Miami was at or near the bottom of almost all of the significant statistical categories, including 28th overall on offense and 23rd overall on defense, with a run defense ranking 32nd in the league ... Miami did finish fourth against the pass behind Tampa, Indianapolis and Pittsburgh ... K Jay Feeley (21-of-23) ranked 2nd in the NFL in field goal percentage ... Contributing significantly to the Dolphins’ malaise were a spate of injuries on both sides of the ball, a very young group of players, and rotating QBs ... Green was lost for the season when placed on injured reserve on Oct. 20 with a concussion ... Cleo Lemon, who subbed for Green and quarterbacked the game against the Ravens, earned AFC Offensive Player of the Week honors for his 23-of-39 for 315-yard performance and a 64-yard TD pass in overtime to WR Greg Camarillo ... Miami’s second-round pick and current Raven, QB John Beck, started four games and played five overall, completing 60 of 107 passes for 559 yards, one TD and three INTs in his rookie campaign ... Beck became the sixth Dolphins’ rookie QB to start a game, in the company of Bob Griese (1967) and Dan Marino (1983), among others. 2002-06: (with San Diego) Was named offensive coordinator and launched his aggressive attack on opponents. 2006: Led the NFL in scoring with a team-record 492 points ... It was the third straight season the team scored more than 400 points ... Over those three seasons, the Chargers amassed 1,356 points, a figure surpassed only by Indianapolis (1,388 points) ... Also, it was the 10th-highest scoring total since the NFL went to a 16-game schedule in 1978 ... The Chargers were the only team in the league to rush for 2,500 yards and pass for 3,400 yards, and they led the NFL in red zone TDs – 42 TDs in 62 trips (67.7%) ... SD also set a team record by rushing for more than 100 yards in 14 of its 16 games and scored 20 or more points in all but one of those contests ... Rivers posted a 14-2 record in his first season as a starter, tied for the second-best record by a QB in his first 16 starts ... His play-calling helped Tomlinson become the 2006 AP MVP when L.T. led the league in rushing with a teamrecord 1,815 yards and set single-season NFL records for most total TDs (31) and most rushing TDs (28) ... Six members of Cameron’s offensive squad were named to the Pro Bowl. 2005: Chargers were fifth in scoring ... Cam oversaw an offense that produced a 3,500-yard passer (Brees), a 1,000-yard rusher (Tomlinson), and a 1,000-yard receiver (Gates) ... Was the second time in team history it occurred ... Chargers were one of only six NFL teams to feature such a trifecta ... Brees, Tomlinson and Gates were one of only four trios in the NFL to combine for 20 TD passes and 10 TD catches ... Was the second consecutive year that the trio achieved the feat and the fifth time in team history. 2004: SD finished third in scoring with 446 points (third-highest total in the NFL behind Indy and KC) Brees, Tomlinson and Gates were selected to the Pro Bowl ... Cameron was named NFL Offensive Assistant Coach of the Year by SportsIllustrated.com ... Brees finished with 27 TD passes and 3,159 passing yards ... His 104.8 passer rating ranked third in the NFL ... Other Brees’ awards that season included Comeback Player of the Year and Most Improved Player of the Year honors. 2003: With Cam at the helm, Tomlinson became the 1st player in league history to rush for more than 1,000 yards and catch 100 passes ... L.T. racked up 2,370 yards from scrimmage, second most in NFL history, and rushed for 1,645 yards, third most in team history. 2002: Cam’s first season as OC ... Tomlinson rushed for a then-team record 1,683 yards ... Brees made his first-career start, finishing the season with 3,284 passing yards and 17 TDs. 1997-2001: (with Indiana) As the head coach, Cameron was responsible for the creative utilization of QB Antwaan Randle El, arguably one of the most versatile athletes in college football history ... As the head coach, Cameron was responsible for the creative utilization of QB Antwaan Randle El, arguably one of the most versatile athletes in college football history ... Randle El finished his career as the NCAA Division I-A rushing leader among QBs and was the only player in major college football history to both rush for 40 TDs and pass for 40 TDs in a career ... He ranked fifth on the NCAA Division I-A career total yardage list with 11,366 yards, one spot ahead of Doug Flutie ... Antwaan had four of the top five seasons in offensive production in Indiana history. 2001: Hoosiers ranked third in the Big Ten and 19th nationally in total offense (435.3 ypg) ... Also fourth in the country in rushing offense (269 ypg) ... RB Levron Williams led the country in all-purpose yardage with more than 200 ypg, and all five of the team’s O-line garnered All-Big Ten accolades, with four of them earning NFL contracts. 2000: Team ranked 13th nationally in total offense ... Hoosiers averaged 266.4 rushing ypg, which led the Big Ten and was 7th in the nation ... Team’s average of 5.8 ypc ranked second nationally behind Nebraska. 1999: Was 34th in total offense nationally and 19th in rushing ... During his tenure at Indiana, the school was one of only 13 universities in the country that was recognized by the American Football Coaches Association for graduation rates of 70 percent or better for three consecutive years (1999-2001). 1997: Named head coach of the Hoosiers. 1994-96: (with Washington) Launched first NFL coaching assignment as QBs coach. 1995-96: Trent Green, who served as the Redskins’ third QB, became a two-time Pro Bowl QB for Kansas City later in his career and then joined Cam in Miami (2007). 1994: Oversaw development of QB Gus Frerrote. 1984-93: (with Michigan) 1992: Elvis Grbac ended his Wolverine career as one of the mostprolific passers in school history, holding school records in eight different career-passing categories ... Elvis Grbac ended his Wolverine career as one of the mostprolific passers in school history, holding school records in eight different career-passing categories ... Was a finalist for the Johnny Unitas and Davey O’Brien Awards. 1991: The Grbac/Desmond Howard duo set an NCAA record for most TDs by the same QB/WR tandem in a career (31) ... Tied NCAA single-season record for TDs by the same passer and receiver (19). 1990: Added WRs to his QBs duties, coaching Howard (Heisman Trophy winner) ... Also was the position coach for future NFL players such as QBs Grbac and Todd Collins, in addition to WRs Derrick Alexander (former Raven) and Amani Toomer, among others. 1984: Launched coaching career as an assistant under the late Bo Schembechler ... Developed several premier QBs, including former Raven and Pro Bowler Jim Harbaugh (John’s younger brother), who was drafted by Chicago in the first round of 1987 NFL Draft. College: Played football and basketball for the Hoosiers ... Cam earned two letters as a QB for Lee Corso (1982) and Sam Wyche (1983), and two playing basketball for Bob Knight ... Suffered a knee injury (football) in his senior year that ended his playing career ... Graduated in 1983 with a degree in business. Personal: Cameron was a two-sport prep standout for South Vigo (Terre Haute, IN) HS ... His stepfather, Tom Harp, coached at Indiana State ... Cameron and Harp each have the distinction of coaching a Heisman Trophy winner ... Cam coached Howard at Michigan, while Harp was an assistant coach at Army when Pete Dawkins won the award in 1958 ... Was an All-America selection at QB as a senior and earned All-State honors twice and All-County honors three times ... Named Vigo County’s Athlete of the Year twice (1978-79) ... Also led his team to three consecutive state basketball finals ... Was named the winner of the state’s prestigious Trester Award for mental attitude in 1979 ... Was named National Athlete of the Year by the Fellowship of Christian Athletes that same year ... Cam and his wife, Missy, have four children: sons Tommy, Danny, and Christopher, and daughter Elizabeth.